Mola Mbua Ndoko: Wisdom and Ways of the Bakweri People: 75. Fei, asi-nwe, Mbamba a fusa meseva ! Two lunar months later when rumour circulated that President Fei was lying critically sick in a clinic and was likely to die soon, Mbamba secretly requested the three sorcerers who had fortified President Fei to cause him (Mbamba) to grow horns on his forehead so that he would assume the duties of President during the period of Fei’s illness. The sorcerers considered Mbamba's request strange and therefore reported the matter to the Secretariat of the Community. The Community was enraged. Consensus of opinion was that it was inconceivable for Mbamba to expect to be accorded a privilege reserved for the President alone. Mbamba was swiftly arraigned on a charge of attempting to grow horns on his forehead. He was further charged for wishing President Fei to die. “Mbamba ! If you venture to defy the ‘Voice of this Community’ and appear here with horns on your forehead this community will declare you an outlaw, cut off the horns slowly with a blunt cutlass while you are still alive and then gradually crush you to death”. The court stated firmly once again that the horns on President Fei’s forehead are a conspicuous and significant symbol of authority for use by the holder of the post of President alone and that while Fei, the President for Life of the Community of Small size Snakes was alive, no small size snake, not even Mbamba the defeated aspirant to the post of President, would be allowed to grow horns on his forehead. The court found Mbamba guilty firstly, for a determined attempt to defy the “Voice of the Community”, secondly for not being respectful enough to the court, and thirdly for indecent haste to succeed the sick President. The court then ordered Mbamba to pay exceptionally heavy fines. 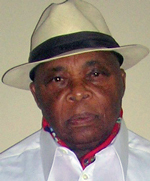 When Mbamba continued to be defiant even at that stage Ikula Nyame advised Mbamba to stop being obstinate and save himself from the grave consequences of disrespect for the “Voice of the Community” - alienation, isolation, continuing psychological discomfort and possible death by execution/assassination). Protocol/rules of precedence should be properly observed. meseva = horns; singular, moseva. mbamba = the name of a snake. mbamba is known within the Animal Kingdom for being a troublemaker. Yota ngule = a lizard. Lisonjo is an insect about the size of grasshopper. Woli-nyama = all animals; the Animal Kingdom.